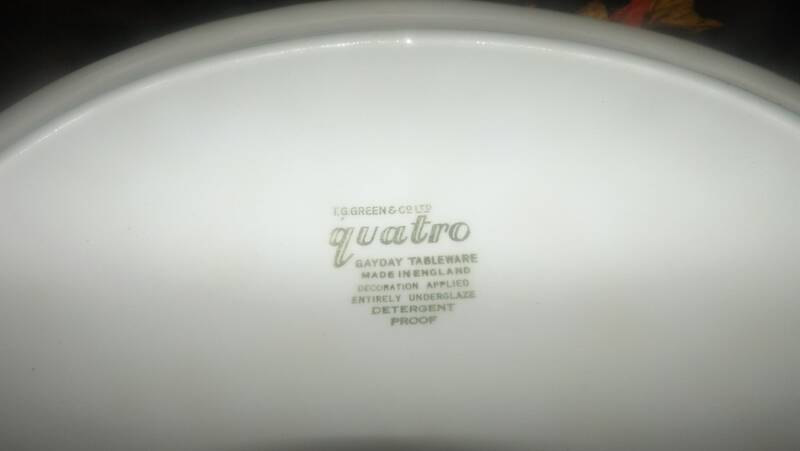 Vintage (1960s) and hard to find TG Green & Co. Ltd. Quatro pattern oval vegetable | serving platter in the Gayday | Gayday Tableware shape. Black, rust, and olive Scandinavian-style geometric | triangles pattern. Quatro is an almost Scandinavian-style pattern of black, rust and olive-colored triangles | geometrics set against a white ground. And, there is a good reason behind this Scandinavian style as the pattern was designed famed Gothenburg ceramics master Berit Ternell. TG Green & Co. wares are made in England and originally operated from a small village in Derbyshire, in the English Midlands, known as Church Gresley. Founded by Thomas Goodwin in the late 1800s, TG Green is more famous for their blue-and-white striped Cornish Kitchen Ware, produced from the early 1920's and at the time known as E-Blue. 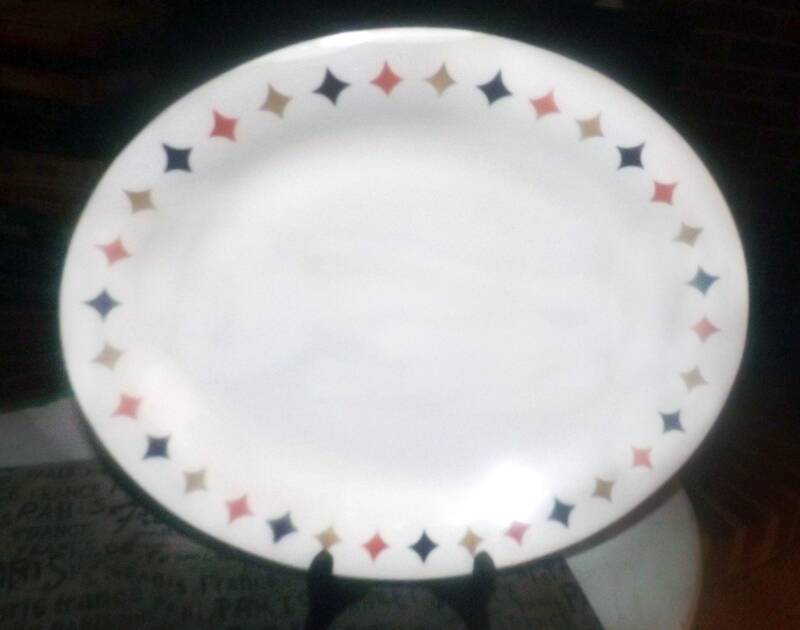 In reality, the Green pottery produced many hundreds of patterns from Yellow wares, Victorian transfer prints, colorful hand-painted Art Nouveau and vibrant enameled Art Deco patterns as well as Wartime utility pottery, avant garde Retro designs (like this one!) and many well known Brewery wares. Having recently been in Derbyshire, I can report that the old TG Green Pottery facility now sadly lays in ruins, the land under private ownership and the pottery, with such a vibrant and varied history once employing more than 1,000 local Brits, is never likely to see production again. The wares of TG Green & Co. Ltd. have thus become highly collectible over the years. In EXCELLENT! vintage condition with NO! chips, nicks, cracks, or fleabites, NO! crazing and NO! marks, stains, scratches or other signs of use or wear. The retro black, rust and olive green geometric border band still bright and vivid with LITTLE TO NO! fading apparent. 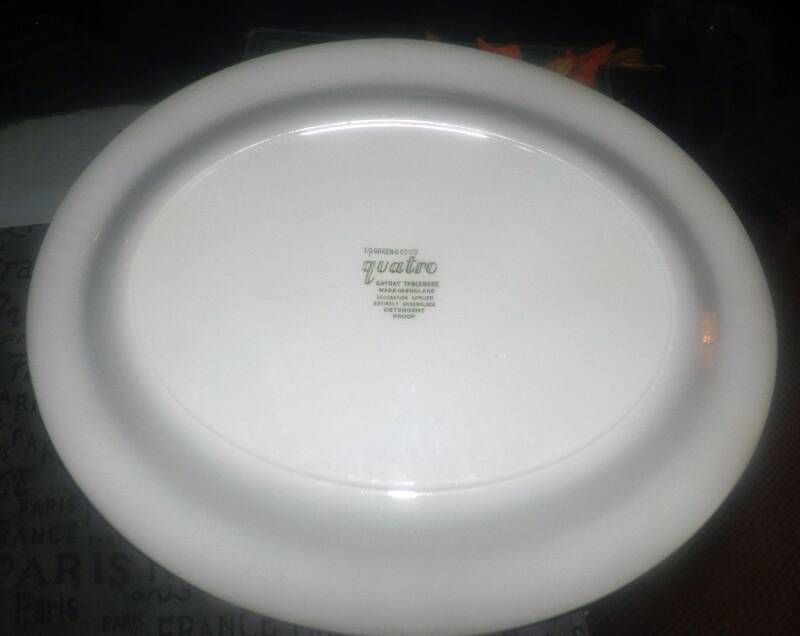 Approximate measurements: 12" L x 10" in diameter (measured edge to edge across the front of the platter) with a smooth, unadorned edge.